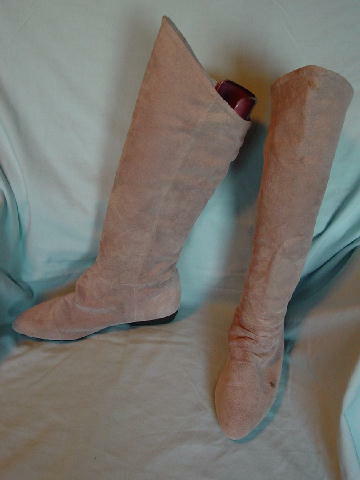 These never-worn light tan-bone suede (leather) boots have modified rounded toes and low heels. The upper front tops are higher than the rear tops. They have a modified ruched effect on the upper foot area. The manmade black soles are nonskid. The interior suede goes from 1 1/2" in back to 4" in front. Below that is a champagne fabric lining. There is a dark spot on the outer left side of the boot. The top front can be worn up or folded outward (2"). 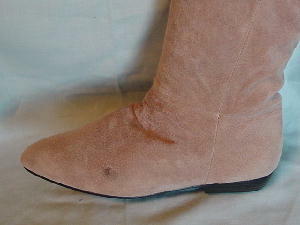 outer heel to top of boot back 13 1/2"
outer heel to top of boot front 17"